Spears of breakfast papaya in Malaysia. I start this food-writing journey in Malaysia, of course, after having just left my steady reporting gig in search of a better fit in the journalism world. I packed a small Tumi roller suitcase and headed to Southeast Asia with my good friend Jesse, an Olympus SLR my dad gave me and many nights of scouring NY Times reviews of my destinations. First food lust: fresh papaya. After a very late (errr early morning) arrival, I wake up to a breakfast buffet at the Hotel Equatorial in the downtown KLCC area. From the vast array of palm-sized pastries, scrambled eggs and even Indian fare, Jesse first nabs a plate of this deep salmon-colored fleshy fruit. He hands me fork full, first squeezing a lime wedge on the fruit (an essential step that only elevates the flavor). The taste is so unreal in its mild, almost lacking in sweet, flavor. The papaya spears look dense like melon, but with the flick of your wrist a fork cuts right through. 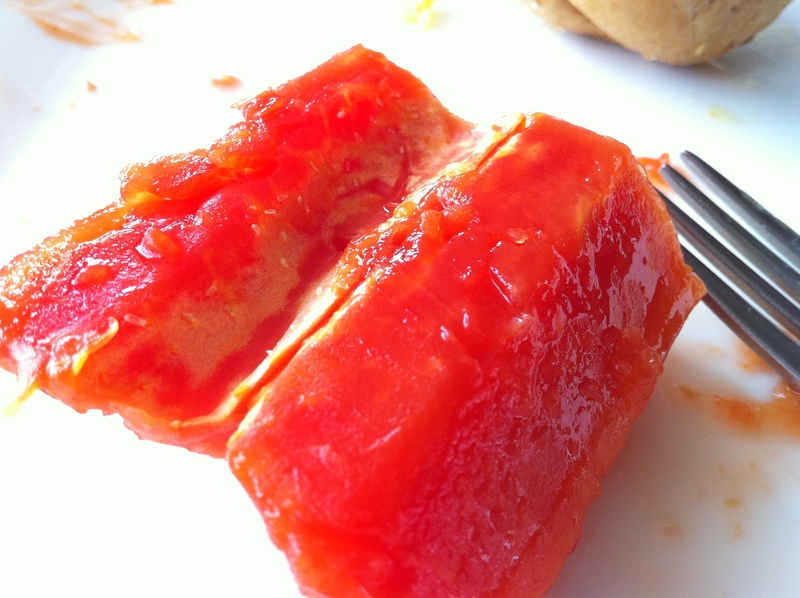 By the end of the meal I find my small white plate shows a puddle of papaya juice that I almost think about slurping. I come to find this is a staple in hotel breakfasts in Kuala Lumpur. I learn later Indonesia and China are two of the top ten producers of the fruit in the world. I know it’s just papaya, but this was not a mundane continental breakfast option. It represented to me much of what I have come to learn from my short time here in Southeast Asia – simple, a bit luxurious and all together tasty. This entry was posted in Uncategorized on June 26, 2011 by Claire Webb. We are off to Vons to look for papaya! made by ellie inspired by Claire Robinson.